Sign up now to discover new spots on the islands or remember old favourites. For example would you like to know where to find roadside stops with views like this? This archipalego is a beautiful and enchanting place to visit. If you have never been there the newsletter will help you to plan a future trip. If you are already familiar with the Islands you will enjoy seeing all the pictures and stories from these enchanting islands. And you will be invited to share your own stories and pictures from your visits. Thanks for your subscription! I look forward to keeping you up to date on the site's progress. 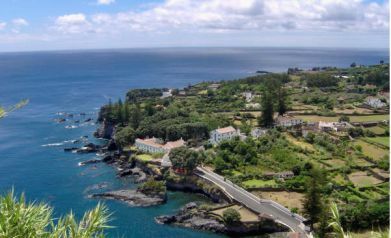 Return to Magical Azores Islands home (leave Magical Azores News Letter sign up page).